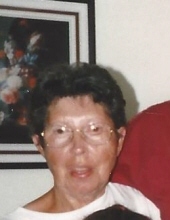 Beulah F. Powers, age 84, wife of Elmer Powers, passed away in Georgetown, Friday, October 19, 2018. She was born in Scott County Kentucky on October 5, 1934 to the late William and Ella Roman Gorham. Beulah for over 60 years worked along side her husband on the farm in Scott County, she loved the outdoors. Beulah was also a member of Dry Run Baptist Church. In addition to her husband she is survived by her daughter, Ruth Powers of Georgetown, special niece, Carlene Sharpe of Georgetown and great niece Shiann Sharpe. She was preceded in death by her brothers and sisters, Carl Gorham, Bobby Gorham, Lonnie Gorham, Clayton Gorham, Aubrey Gorham and Hester Underwood. Visitation for Beulah will be 10:00 am, Tuesday, October 23, 2018 until the time of the service at 12 noon at Tucker, Yocum & Wilson Funeral Home. Burial will follow the service at Crestlawn Memorial Gardens with Randy Hamons, Jackie Elam, Mike Elam, Paul Powers, Dewy Jones and Lewis Wolfe as pallbearers. To send flowers or a remembrance gift to the family of Beulah Powers, please visit our Tribute Store. "Email Address" would like to share the life celebration of Beulah Powers. Click on the "link" to go to share a favorite memory or leave a condolence message for the family.